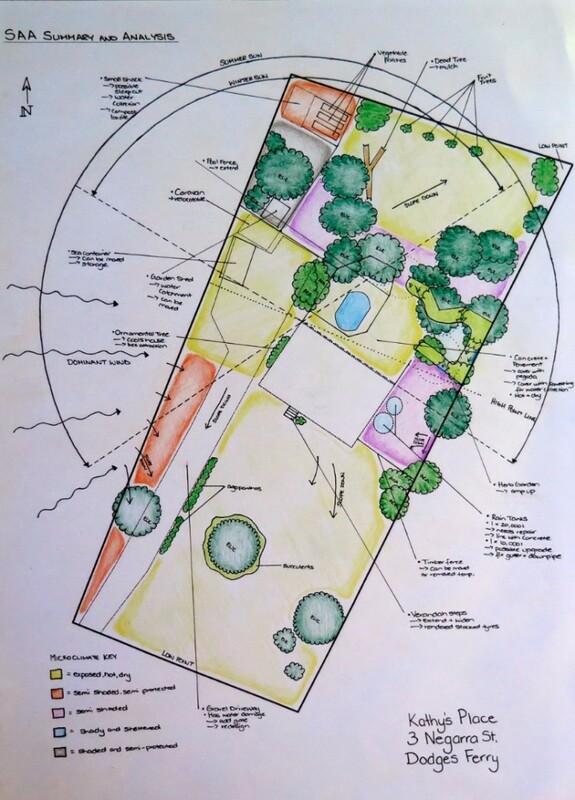 We were really impressed by the quality of the work from all the students at our recent permaculture design course. 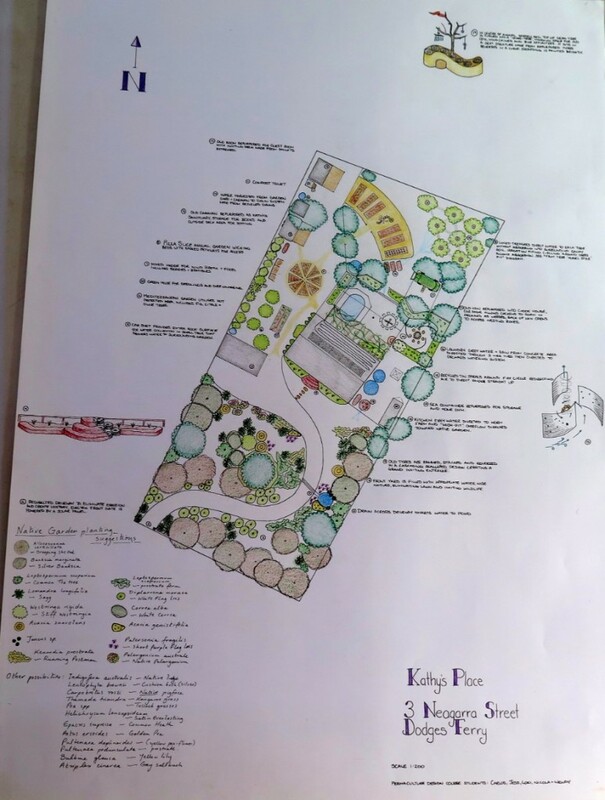 Here’s an example of just one of the group designs completed by some clever, deep thinking folks. Before we start working with the landscape, the first thing we teach our students is “people analysis”. 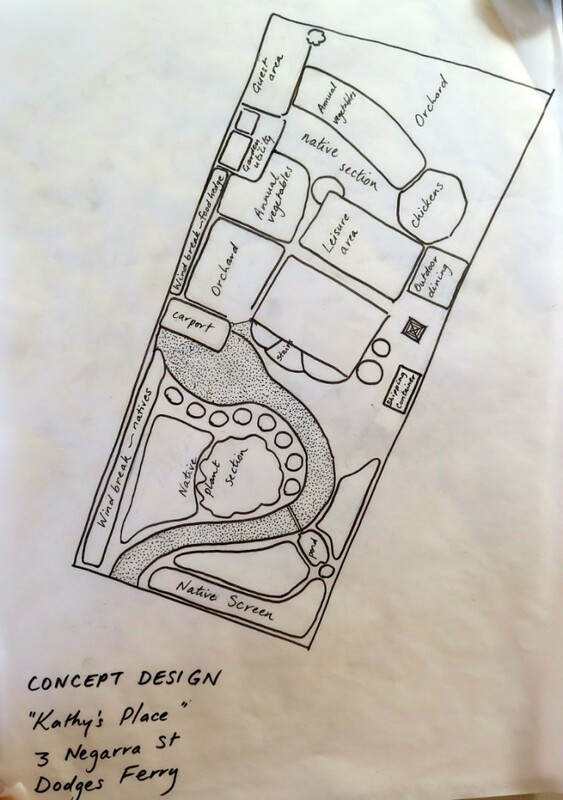 By getting to know the people living on the land – their needs, desires and capacity you can ensure that any design you create will be a design for *them* and not something you impose onto them. This is possibly the most important thing we try to gently ram into our student’s heads and hearts. We can list too many stories we’ve heard of design jobs gone wrong as a result of people not listening to the client. Years ago I got to work with Dave Jacke who taught us how to make a goal statement – a present tense statement that summarises what the vision for the design is. This is the outcome of people analysis and functions as a reference point for designing and implementing. 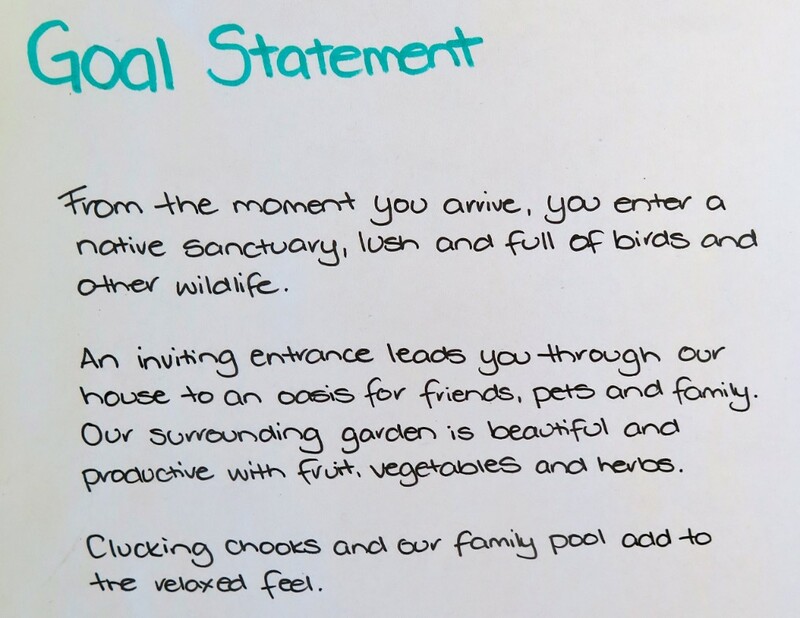 This particular design group’s goal statement can be seen below… Notice how you get a strong feeling of what this property is like? That’s what we’re aiming for, rather then specific design solutions. The second key step in the design process is to do the “site analysis and assessment” (SAA) process. Simply put, this is where you document what is already on the property (not what you want to design) and the sectors (external energies, i.e. sun, wind, traffic etc) impacting the property. There is of course a deeper level to this stage as landscapes are already their own “whole”. As designers our job is to read landscapes and differentiate the existing parts and work within those. That’s a really important detail that isn’t always articulated well in permaculture text. The idea is that you don’t get too stuck/attached with one idea at such an early stage of the design process. So you can just take note of them in an orderly manner and get back to them later on when you’ve gathered *all* the information you need to make an informed decision. The next step is to crete a concept design. This is a broad design with minimal detail, showing what goes where in a basic “bubble diagram” as seen below. At this stage you’re still not fixed on a certain approach to the design, rather you’re testing this concept with the people living onsite. Sometimes you’ll make little tweaks other times you might start again, although that’s rare. At the same time as doing the concept design, a permaculture zones map is also developing. Zones are a method of organising your property efficiently according to the phrase “oftenest nearest”. This means you place the things you need most often (herbs, worm farm, kitchen garden) closest to your zone 0 which is the heart of your property (house or workplace). And place the things you need least often (i.e. native plants for small birds, dam, wood lot etc) furtherest away from zone 0 – in your zone 3, 4 or 5. 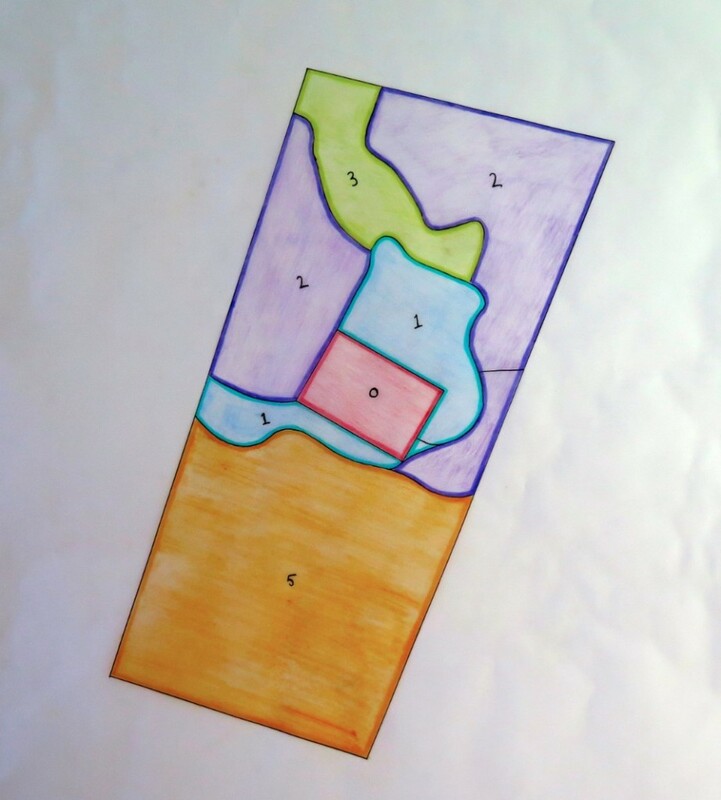 Not all zones need to be included in one property so you wont see all of them all in the example below. 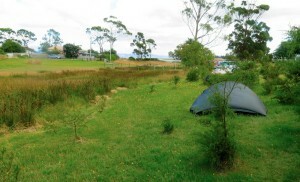 You can read more about permaculture zones here. After any tweaks have been made, you’re finally ready to do a final design showing detail around plants, structures, access, water and more. Funnily enough, this is the quickest and easiest stage of designing as you’ve already done extensive ground work leading up to this point. It was such a pleasure to teach/learn with this bunch of hardworking legends. It never ceases to amaze us what transformations can happen over the period of this course! 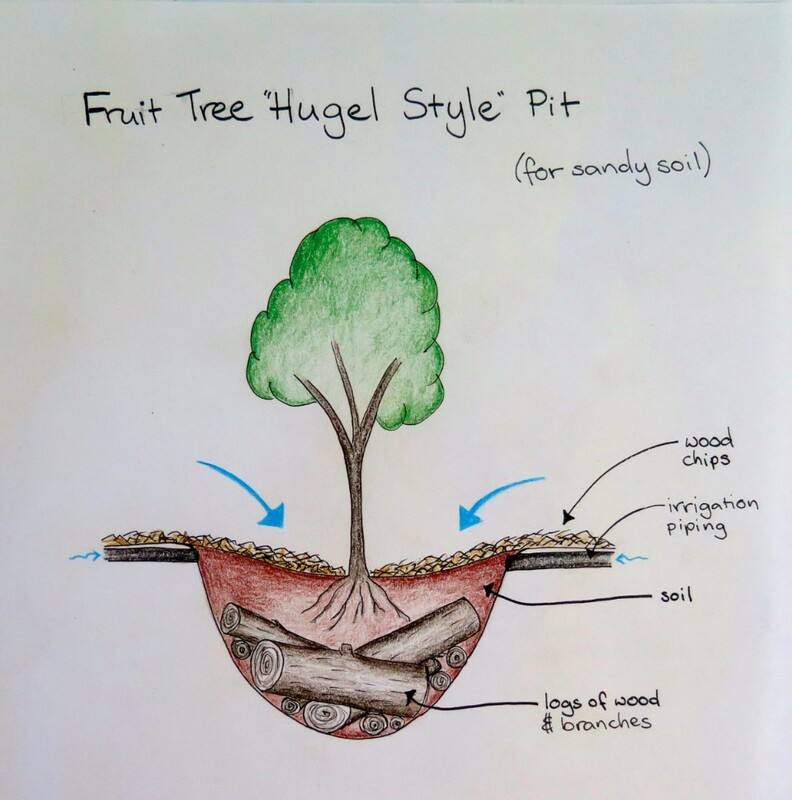 Interested in learning about permaculture design? 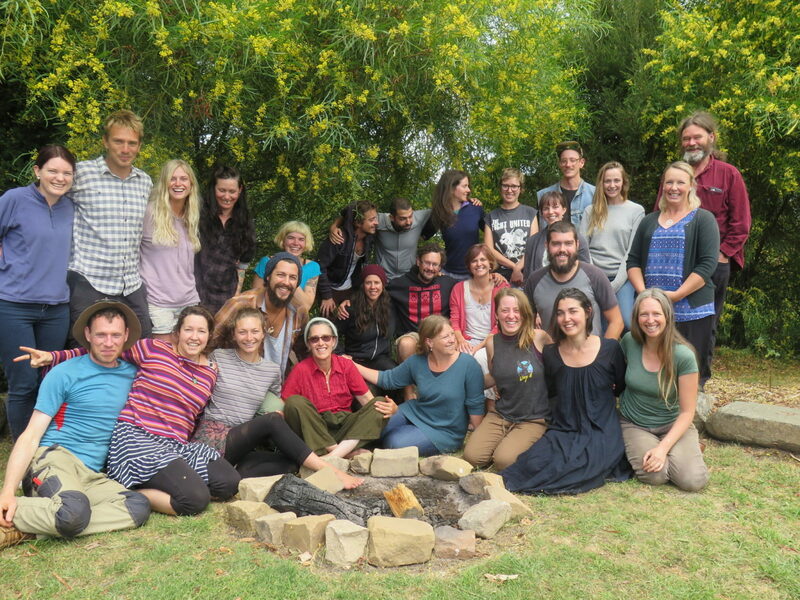 Join us on our upcoming Introduction to Permaculture this May or our part-time Permaculture Design Course this June and July in Hobart. Based in northern Tasmania where the soils are red and black and rainfall abundant, The Grain Family has emerged from the same land where Elgaar Farm is based. 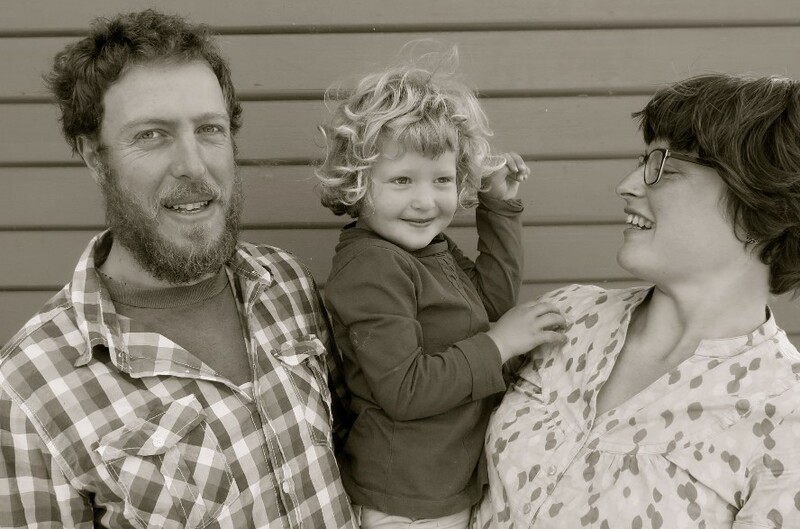 Run by Tonia’s parents (Joe and Antonia), Elgaar is Tasmania’s only organic, ethical dairy – The Grain Family have now entered into a share farming arrangement with them and are now venturing out from under Elgaar’s wings to forge their own way as farmers. How awesome. They grow everything from oats, linseed, rye, spelt and wheat – plus they’re always doing trial crops to see what else they can grow. 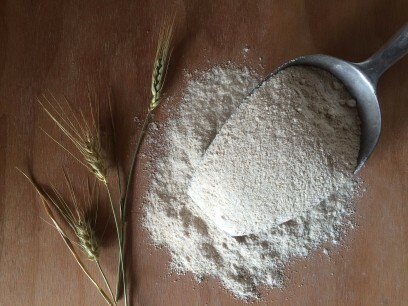 As they’re passionate about showing people the potential of grains as truly delicious foods in their own right, they mill grain fresh each week. By milling small batches weekly, they’re ensuring they’re at their absolute freshest and most delicious. 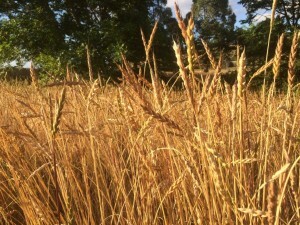 Growing grains in Australia is generally linked with unsustainable farming practices. Mainstream grain cropping will often use huge amounts of water, chemical inputs and heavy machinery to guarantee yields. 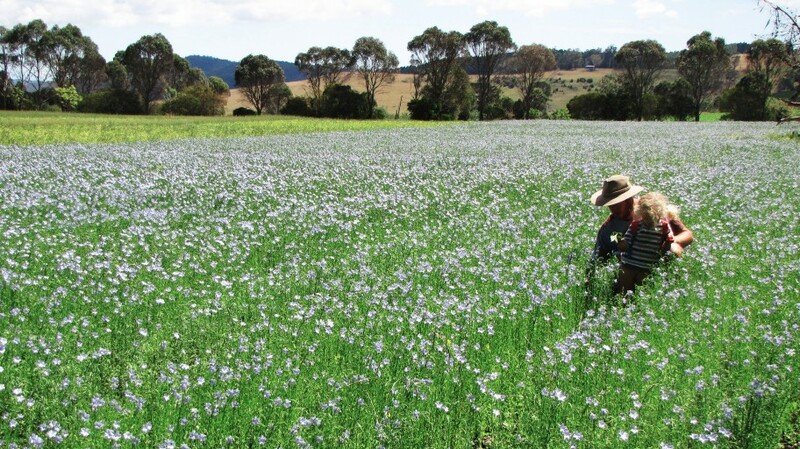 However over the past decade or so we’ve seen more innovative and sensible approaches to growing grain like Colin Seis from Winona Farm in NSW who co-developed “pasture cropping”. 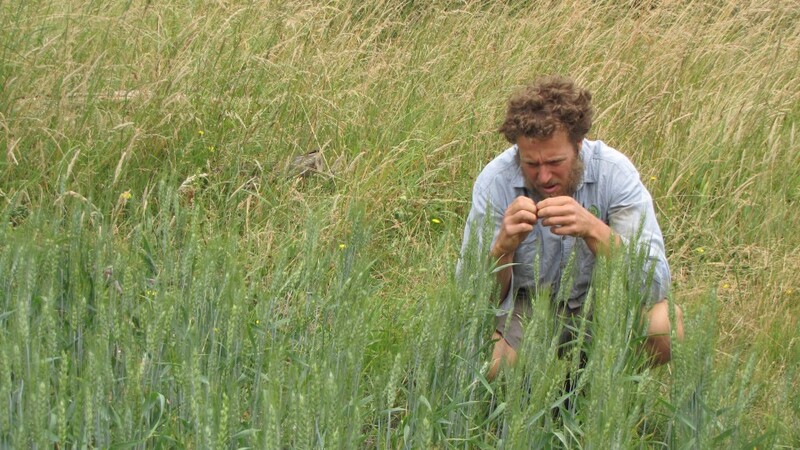 The Grain Family’s approach is centred on building and maintaining soil health. Heavily inspired by pasture cropping, they’re looking at ways at reducing tillage and are constantly refining their approaches. We started growing grains three years ago on an existing dairy. The nature of our heavy soils, dry summers and wet winters, and the need for animal feed to make milk, has meant we’ve adopted a ‘double cropping system’. We sow all our grains in spring and harvest in late summer and sow a grass/legume mix that grows over winter and is cut as hay in spring. There is always something growing. All added fertility comes from the grazing animal’s manure which we spread finely over the paddocks each year where it composts. are generally heavily connected with their local area and economy, meaning money stays in the region leading to more resilient and robust communities. The Grain Family are a small piece of the puzzle – helping to form a whole picture of what a local, sustainability food system can look like. With these folks on board it’s looking good for Tasmania in particular, as well as the rest of Australia. More of this please. 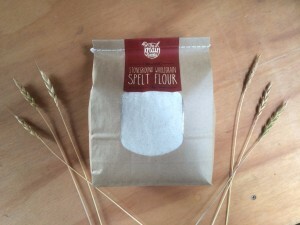 Where can you buy these delicious grains? If you’re lucky to live in Tasmania, you can find them each week at the Harvest Market in Launceston (on Saturdays) or Farm Gate Market in Hobart (on Sundays). 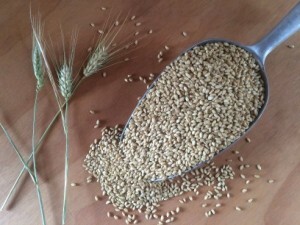 If you live elsewhere you can still get your hands on these grains through the Farmhouse Direct’s online shop. The Grain Family post freshly milled grain to anywhere in Australia every week! 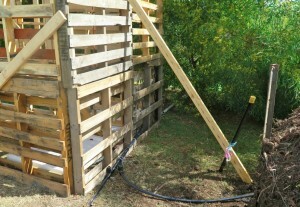 We recently made our first compost powered shower system for our two week permaculture design course held at Okines Community House and Garden. This is a method originally developed by French man, Jean Pain and has since been replicated and adapted all over the world. While we live in a fairly moderate/cool temperate climate, others with heavy snow also do this to heat water over freezing winters like Ben Falk in Vermont (skip to 2:20 in this video). So you can drop any thoughts you night have that this will only work in a warm climate. 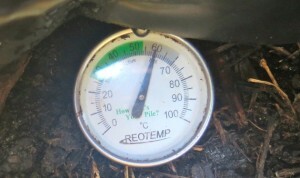 Hot compost is hot compost regardless of the climate. This method is traditionally based on using mostly woodchips and water, we used aged woodchips and aged chook poo (layered fairly evenly) plus water as this is what we had available to us. Before we go any further, we must say a special thanks to our friends over at Very Edible Gardens (VEG) for showing this particular version and answering approximately 100 of our questions. 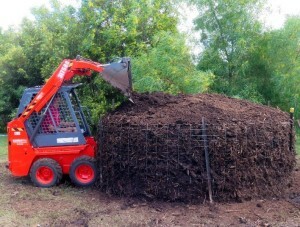 Hot compost is where you arrange layers of carbon and nitrogen materials like a lasagne with water in between. It needs to be at least one cubic metre for it to heat up, with the desired heat being around 60-65 degrees. This is hot enough to kill off bad pathogens, any hotter and the good biology can suffer. For this particular system we’re wanted it to get as hot as possible as heating water is our focus, not compost for the garden. However saying that, this compost will eventually be used in the local community garden where it was built which will still be beneficial to the soil once it’s had a rest. You can read about how to make hot compost for your garden here. Just like making any other hot compost system, layer your carbon and nitrogen materials – we did a couple of layers to establish the footprint of the pile (around 3m in diametre) and set up the internal pipe system. This consisted of four star pickets as the framework and 25mm of poly pipe tied onto it. 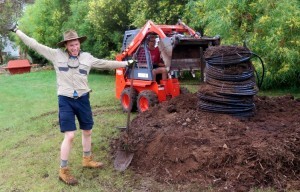 Dan and Carey from VEG recommended using 100m of 50mm rural poly pipe, but we decided to use 25mm pipe as we could then use it easily on our property once the pile is dismantled. If we had our time again we would use the 50mm – more on that later. 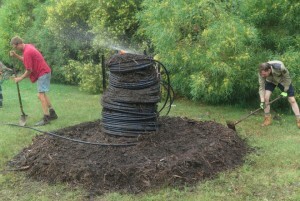 Water is key to any hot compost working – we alternated between the sprinkler approach (having it running on top of the internal pile) to having two people stationed there with hoses, watering in each layer thoroughly. You really don’t want any dry patches in your pile as this will preventing it from heating up evenly. 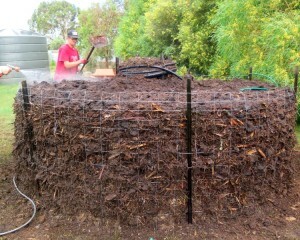 Put wire around the edge of your compost as seen below. This helps you build a pile with as much volume as possible – maximising the space you have and ensuring there’s plenty of mass to heat up. Only once you reach the top of the wire will the pile start to taper off into a pointing tip. Blake the legend watering in the pile from the top! 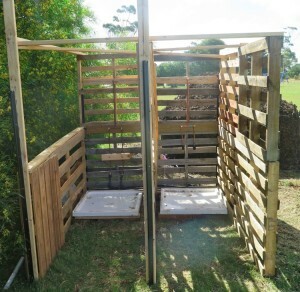 We built the shower block from timber pallets salvaged from building sites and shower bases from the local steep shop, for privacy we covered them in sheets. 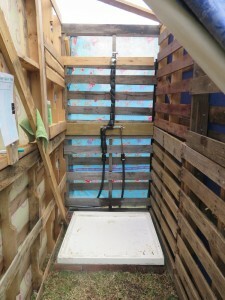 The stalls were located as close to the compost pile as possible so the hot water leaving the pile didn’t have far to travel – meaning it wasn’t going to cool down before it got to the actual shower head. In the photo below left, you can also see we insulated the hot water pipes leading up to the shower head. We needed to design and build a temporary greywater system to filter the water coming through the shower before it hit the neighbouring wetland. 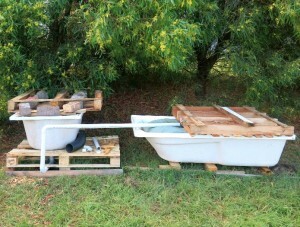 We made a simple, safe and effective bathtub system to do this job. 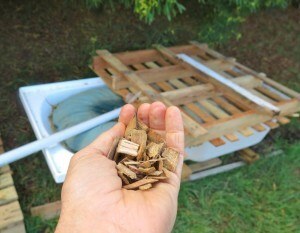 We lined two baths with old doona covers, filled them with coarse woodchips and ran pipes from the showers to them, using gravity to move the water where it needed to go. The woodchips act as a filtering sponge, as water moved through them any grease and soaps were caught meaning the water leaving the system was filtered and safe to enter the beautiful wetlands which lead straight to ocean a few hundred metres away. The short answer is yes, we successful showered 30 people over two weeks, averaging around 10-15 each day (spread over the morning and evenings). As expected, people only had short showers up to 5 minutes at the most – which is more then enough. The recharge wait between showers was somewhere between 5 – 15 minutes depending on how many people wanted to have showers. 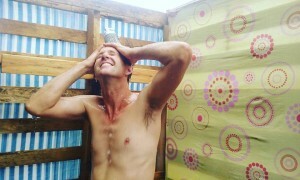 Thermometre showing 60 degrees and Anton the babe enjoying his first hot compost shower. Use bigger pipe (as we were told to do). 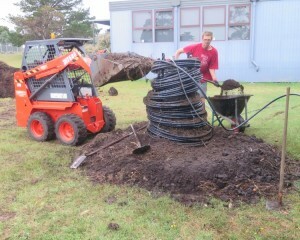 We used 25mm instead of 50mm pipe as we could easily use that in our irrigation system afterwards. What we didn’t think through properly is that this drastically decreases the volume of water being heated up at any one time in the pile. Cover the pile with the tarpaulin (or any insulating layer, i.e. 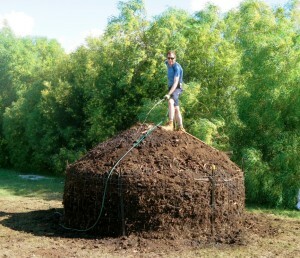 strawbales) the day we built the compost and not one week later. To be fair, there were *crazy* winds on the day we built the pile so it wasn’t going to work. But a week later, the pile had definitely heated up to 40-50 degrees but the showers were only luke warm at best. 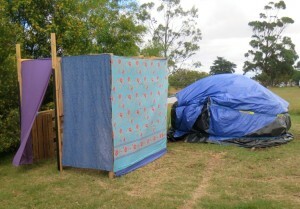 So we added the tarpaulin to it and the next morning – boom! 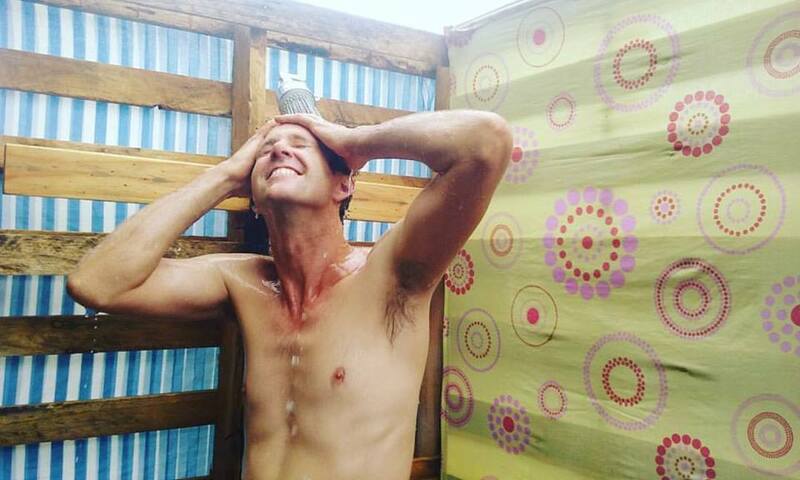 The heat was up in the 60s and showers were hot. Our friend Nick from Milkwood tried to reassure us that it would have heated up anyway with a bit more time, as it’s just such a big compost pile. While he’s probably right, the tarp seemed to help bring it home *quickly* which we really needed for the course. Get a longer thermometer stick – the thermometer you can see above only had a stick 45cm long. As the pile was 3m in diametre that meant we couldn’t gauge the centre of the pile’s temperature without digging a little hole in the side and compromising its heat retention capacity. So we just left it to measure the outer edges of the pile – which was still reading around 60 degrees after three weeks. Make the shower stalls a but more weather proof. While it’s summer and mostly warm and lovely in Tassie, we still get days where the wind blows and you reach for your jumper. If we had more time and resources it would have been preferable to make the shower stalls a bit more solid with a roof and solid door. This design would be perfect for the warmer parts of the world! It wasn’t as affordable to build as we had hoped. 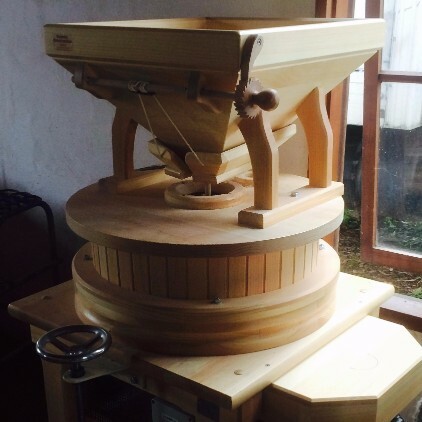 In the end we had to pay for all organic inputs, hire someone for two days to help build it, buy random bits and pieces and hire the machine – coming in at just under $1500. In theory we were going to source woodchips for free from the Council, organise a community working bee to shovel everything and just pay for some nitrogen (chook poo). Next time, we might think a bit harder about how to bring this price done to make it more viable. Of course, if you live on a farm with lots of resources it’s likely you could do it for under $500. Talk to the school across the road 6 months ago…. We built this pile because we were told there were no showers within easy walking distance. 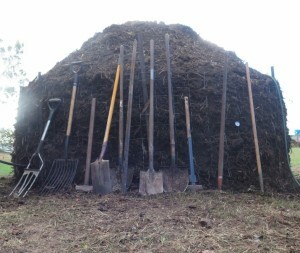 The day before the course, when we were a bit worried about whether the pile would heat up enough (and we eventually added the tarpaulin) I went, stuff it – even though we’ve been told there’s no showers in the school I’ll just go check. Turns out there was a whole shower block 150m from us and they handed me the key in two minutes and happily let us use it as a back up for the two week course. To say we felt a but silly is a gigantic understatement – swear words were mentioned. 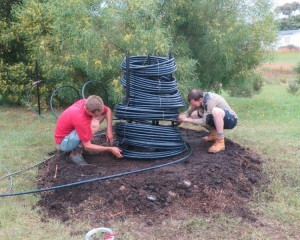 On the major up side, we got to build a compost powered shower, how cool is that!!! I’ve wanted to do it for years and overall, learning new skills trumps feelings of silly-ness (eventually). For shizzle! Despite the long list of “stuff ups” above, I’m so pumped for this method of heating water. For years it’s been on my list of awesome things I want to do – adding to my skill set and now it’s firmly lodged in my head, heart and hands. I look forward to making our next compost shower – it’s going to be a walk in the park after all the things we learned from this time round!